Open today! This photo was taken a few weeks ago, I know there's a lovely real sign there now). 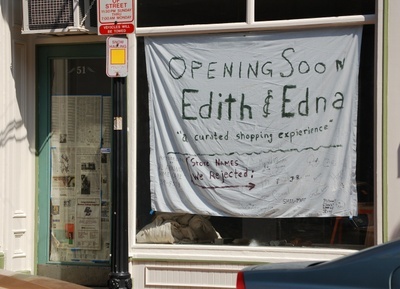 Edith & Edna, on 51 Exchange Street in Portland (Maine!). It has been such a treat to see this project take shape over the past couple of months...I couldn't be more thrilled for Brandie and Julie, who are now working their *dream* with this fabulous shop full of handmade lovelies. This is my first experience with any kind of wholesale, but I'm pretty sure that all experiences are not as joyous as this has been. It has been a *pleasure* to make things that are received with such generosity and warmth, and it's an *honor* to be among the other artisans featured in the shop. I don't want to give away any surprises about what's inside, but it was pretty amazing to walk through the shop a week ago and to see AND touch the work of artists I've admired online for so long, and many new ones too. And all in the company of two lovely shop owners. Now that it's all up and running, I cannot wait to go shopping this week! (And I'll be sure to bring my camera along too). I think I've posted a bit of what I was working on for the shop, but not all of it. So indulge me for a moment while I do. Here's the jumbled lot of it before packing it up. 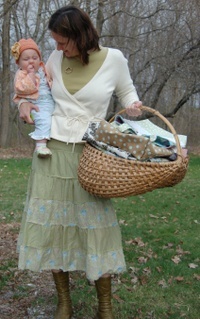 Children's aprons, handbags, shoulderbags, and in the back- baby gift sets (blanket, bib, and fabric card). 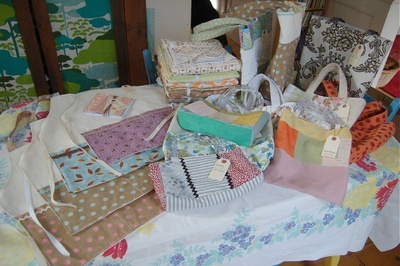 I used a mix of vintage and new for everything, and no two pieces are the same, which kept it fun for me. The greatest thing about selling wholesale locally was that it allowed me to indulge in my ridiculous fantasy of being Eliza Doolittle walking down the street with a basket full of my things to sell (in this case, handbags instead of flowers). With a baby on the hip to boot. I'm so ridiculous. But it was sooo much fun walking on the cobblestone streets in town like this, okay? Best of best luck to you, Edith & Edna! And congratulations to you, Brandie and Julie!